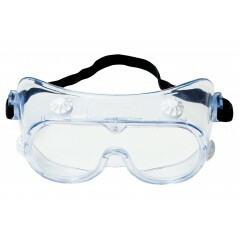 Chemical Splash/Impact Goggles, worn to help protect eyes from certain airborne particulates and chemical splash, feature vents that are designed to help prevent liquids from entering the eye area. The polycarbonate lenses are the strongest, most impact-resistant eyewear lens material available. By buying this product you can collect up to 250 loyalty points. Your cart will total 250 points that can be converted into a voucher of 0. -Polycarbonate lens absorbs 99.9% UV. -Meets the High Impact Requirements of ANSI Z87.1-2003. -10 safety goggles per case. These safety splash goggles are a dependable and economical choice that offer a sturdy polycarbonate lens, adjustable elastic strap and a wide opening to fit over most prescription eyewear. It is built with an indirect venting system that circulates air and helps minimize fogging, allowing for use in varied environments and conditions.